Exercising is an essential part of life, but with a full lifestyle, it can be easy to skip. The damage this does over time is clear, but if you’re working hard, you may find that scheduling separate gym visits just doesn’t work for you. Many of our clients in managed communities have found that having a gym on hand is a great way of staying in shape – and if your community doesn’t have a dedicated gym, setting up a home gym in a your spare room can be a great way to give yourself a reason to work out. By having a dedicated space at home, you can work fitness right into your day without wasting travel time – and if you’re looking to sell your home, a home gym is the kind of special feature that can really add value to buyers, and get you a better price when you sell. Here are a few tips for making a great home gym. One of the first things you need to do is to choose the space for your home gym. 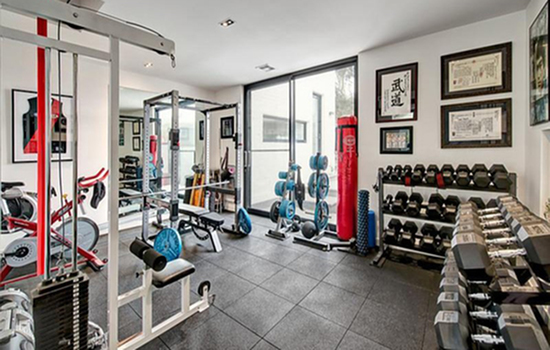 If you have a spare room at home, or a basement with some space, it’s the obvious choice to set up your gym – but if your home is already being used entirely, you may have to move a few things around before you set it up. An area of 100 to 150 square feet should be enough to set up a simple space to work out in, depending on what equipment you’ll be using, but if you have the space, 200 square feet can help you feel even more comfortable. Lay out your equipment with enough space that it doesn’t feel cramped, and remember to always follow the instructions for safety on any equipment you decide to use. Once you’ve created the space for your home gym, you’ll need to start setting it up. To identify the equipment you need, think about your workout style and define your goals, so you can stock up on the equipment and gear that will help you the most. For instance, if you intend to do a lot of cardio, it may be pointless to purchase a leg press machine. Or if you want to build muscle, a treadmill may not be your first choice. Identifying your workout style can help you spend your money on the right equipment. It can be tempting to purchase all the equipment you think you’ll need right at the start, but a better way is to draw up a workout plan for the first two months, and to buy the gear that you’ll need for that plan, then reassess your routine and decide what you need in order to follow through on it. Stocking up slowly and steadily this way helps you stay committed to your plan. As with everything to do with fitness, persistence and discipline are key. Draw up a simple exercise plan and stick to it for a couple of months before you switch it up. Remember to exercise safely, and if you can work out with a roommate, your partner, or a friend who lives nearby, you can help each other to perform, and make sure you’re able to stay safe on equipment that’s recommended for accompanied use.